Meeting this challenge is the focus of Developing IP-Based Services. 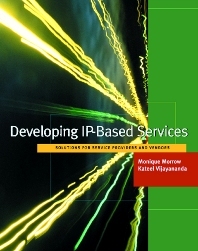 The only book of its kind devoted exclusively to IP-based services, it provides a blueprint for all the engineers, managers, and analysts who must come together to build these services and bring them online. Inside, you'll find just the right balance of business and technical coverage, introduced with a lucid discussion of the principles of service development and wrapped up with three case studies illustrating effective provisioning in today's marketplace. Read the chapters relating to your role, and you'll play it more successfully. Have your team read the entire book, and you'll achieve a level of collaboration and shared understanding that will quickly accrue to the bottom line. Valuable insight from authors with extensive service provisioning and product development experience. Written for business and technical readers at a wide range of companies, including established telecoms, ISPs, ASPs, Clecs, bandwidth brokers, and vendors. Probes the business issues that will make or break your effort, including shortening the development cycle and choosing a competitive model. Provides the technical coverage required for successful implementation, according to the terms of the business model you choose. Focuses on the IP technologies that offer your service and its users the greatest value, including MPLS, Voice Over IP, and multicast. Helps you meet tough challenges relating to security and Quality of Service. Concludes with case studies illustrating successful service development and deployment in three companies. Monique Morrow, CTO Consulting Engineer at Cisco Systems, has twenty years of experience in IP internetworking, including work for both enterprise companies and service providers in the US and Europe. She holds an MS in Telecommunications Management and an MBA. Kateel Vijayananda, Network Consulting Engineer at Cisco Systems, has ten years of experience in data networking, featuring design, implementation, management of IP networks and software development devoted to OSI protocol stack implementation. He holds a PhD in Computer Science.